At the ChampionBoards BLOG, you’ll learn about economics, finance, and a host of exemplary women role models. We don’t hesitate to debunk “old wives’ tales” that women still believe, but which hold them back. Our goal is to help you understand governance: to see the opportunities and the power of small groups focused on growing your business to its full potential. 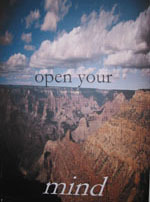 Open your mind. Tapping the Wisdom that Surrounds You: Mentorship and Women (Praeger/ABC-Clio: September 30, 2014). Tapping is a collection of short stories from women and men about accidental and purposeful mentor experiences that helped them grow: at home, at school, at play, at work, in politics, in the media, and in memoriam. Preface and Conclusions discuss the real origins and meaning of “mentorship”. 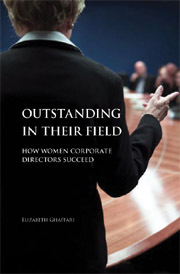 Outstanding in their Field: How Women Corporate Directors Succeed (Praeger/ABC-Clio: June 2009). Foreword by Toni Rembe, co-founder of the Rock Center for Corporate Governance (Stanford). Outstanding is a collection of profiles and interviews with 15 women corporate directors, telling their own life stories about career-building and how they earned a seat in the boardroom. It identifies the high probability paths into the boardroom. Select either the icon or the book cover to go to each website. At ChampionBoards, we challenge you to think differently about YOUR career and YOUR business. How could a great board of advisers help you achieve your future? 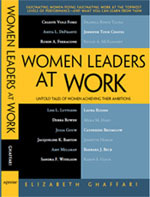 You’ll learn about economics, finance, and a host of exemplary women role models. We don’t hesitate to debunk “old wives’ tales” that women still believe, but which hold them back. Our goal is to help you understand governance: to see the opportunities and the power of small groups focused on growing your business to its full potential. Think differently: open your mind to the learning experiences that surround you. A strategy advisor. Are you ready to take your business or your career to the next growth phase? Do you understand the economics, finance, and governance that will help you succeed? Are you trying to do it “all by yourself?” What makes Champion Boards unique?